In our last blog post, we featured one of the value-added services General Plastics’ provides, specifically the production of gap seals and trim pieces. 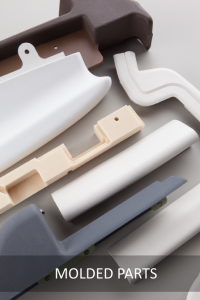 This is a segment of our molded parts program which showcases our build-to-print capabilities satisfying customer specifications from custom foam formulation to final assembly. This post is the second of a two-part series on our molded parts program, featuring our padded parts capabilities. In this installment, Christie Gibbs, one of our plant supervisors, answers some questions on our padded parts program. General Plastics fabricates custom-molded parts to customer specifications. In addition to gap seals and trim pieces, the company also produces padded parts. How would you describe our padded parts program? CG: Our department primarily produces padded parts for the flight deck of airplanes. 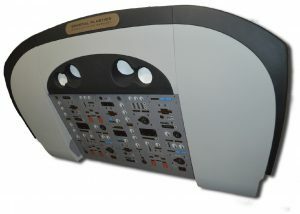 This consists of seat pads, overhead and control panels, glare shields, footrests, kick strips, and more. One can say these parts have a decorative function since these are visible on the plane. However, there is also a functional aspect to pieces like the glare shields and footrests. These are made with a combination of our high density, flame-retardant flexible and semi-flexible polyurethane foam with physical properties required by our customers. Can you walk us through a typical process for producing a padded part? CG: The process kicks off with the receipt of a drawing or a Photo Contact Master (PCM), a life-size drawing for scale, from the customer. Once we receive the drawing, it is reviewed and evaluated for possible items that we would need to mitigate. The sooner these items are reviewed, the better. This helps us avoid delays in the production process and get it right the first time around. From drawing approval a mold is made, which then goes through First Article Inspection. This is the same process we follow when producing gap seals and trim pieces. A First Article Inspection is the production of test parts from the tool to verify that it is accurate. The part will only go into production once the tool passes the First Article Inspection. Once the parts go into production and are completed, it goes to our Quality Assurance (QA) department for final inspection before it is delivered to the customer. Most of our projects require QA documentation so those are provided to the customers as well. Can you give us some information on a few items addressed when the customer’s drawing is reviewed? CG: Based on the drawing specifications, we might call a meeting to determine possible complications that may arise and address them immediately so as not to negatively impact the timeline. Our QA department is part of that meeting and they help determine what those issues may be and will make recommendations on how we can solve it. A recommendation may be given on foam formulation, dimension tolerances or paint type. We know our foam and our process better than anyone so we’ll make the best recommendation based on our customer’s needs. Are there limitations to how complex the padded parts can be? CG: Like the gap seals and trim pieces, we have the in-house ability to create custom parts for our customers, from custom shape and size to adding paint and finish and other non-foam components to produce the finished part. We can utilize fabric reinforcements to improve tear resistance of our lightweight foams if customers are looking for improved durability more than flexibility. We can also apply hook and loop fastening systems, metallic brackets and other accessories as the drawings require. In our area of padded parts, we use several different colored foams that are produced in another part of our plant. We also use very durable and resilient flexible black foam, which is a hard, dense foam that does not require any paint. These are used for kick rests, foot rests, kick strips and go along the side of the cockpit. Other than government projects, which have their own military specifications, our padded parts comply with Boeing and other aerospace material specifications. How does General Plastics ensure that every part meets customer expectations? CG: Through rigorous quality control and continuous hands-on training of our team. Production of our padded parts is technique-based and requires great attention to detail. It’s a very hands-on process, meaning it is up to the operator to properly place the different components in place, versus a machine. There can be no room for error. Each new member of our team is trained starting with a simple, basic part. This gives them the foundation for all parts that we produce. As their skills progress, they move on to the more complex parts. In your opinion, what sets us apart from other companies? CG: Quality. We have several QA check points throughout our process. This includes First Article Inspection of the tool that I mentioned earlier and the meetings where customer’s requirements are thoroughly reviewed. The different parts we receive from outside suppliers are also thoroughly inspected. Our production process includes receiving foam from other parts of the plant. Before we can use the foam, it is tested for flammability and compression to ensure that it complies with standards. That way, before it gets on our production floor, we know that it will function as specified and that we can produce high-quality parts from it. The customer or our QA department may also require hold procedures throughout the process, where our QA department will conduct an inspection during certain parts of the production process before proceeding to the next step. Once the customer order is completed, every single part is inspected to ensure it is consistent with the customer’s drawing. Beyond fulfilling the requirements of a complex design, we know that we’re delivering a high-quality product that our customers will be extremely satisfied with.